Fancy a holiday with a difference? Then pack your bags and get ready for some extreme active ageing. Us 'older' folk are heading away from the traditional hotel holiday and at last, having fun! Carol E. Wyer is an ex-teacher and linguist who began her working life in Casablanca. Currently writing a series of novels and articles aimed at the 'older' woman and man, Carol is also engaged in writing by-line articles and posts for magazines and websites including the Huffington Post. In 2015 she won The People's Book Prize Award for Grumpy Old Menopause. What is 3 + 1 ? Wonderful author - fabulous book! Another superb book. As usual it had be laughing all the way through. Good luck Carol! Your books keep my wife quiet for hours on end ha! Really funny and soooo entertaining, a must have. Brilliant book. Loved every page. Carol's really on a role! Fab book, loved reading it! Too funny. I still grin thinking about some of the activities and trips in this book. Such an awesome book with ways to make a not so pleasant situation fun! A book that is well worth voting for. This very funny book deserves to win. Laughter the best medicine of all. Laughed so much reading this book. What a fun book this is. I enjoyed the way it is set up in an A to Z format rather than by country. It is a lot more fun learning about what you can do in a country and has given me some good ideas for a trip for my fiftieth birthday. I love this author and this book, they're both AWESOME! Loved this book. It deserves to win. Gave my wife and I many laughs and we are going to try out some of the suggestions in the book. Best travel guide I have ever read! Entertaining, informative and very amusing. I laughed such a lot at this book especially the comments at the end of each section. A very funny book. We are going to book Flamenco dancing in Cuba now thanks to reading this. 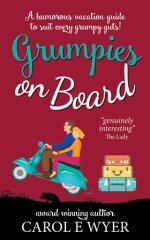 I recommend Grumpies On Board to anyone who wants to keep on enjoying life. A genuinely funny read that will change how you holiday in future. Great read and very entertaining. It will change the way you travel and give you laugh after laugh. Superbly researched and hugely entertaining. Much more than a book about travel. Loved the Mister Grumpy comments in it. He's just like my husband. Hope this book wins as it deserves to. You will not need to browse through holiday brochures for your next trip after reading this book in fact, you're far more likely to go off adventuring. A book filled with useful facts and very funny in parts. Mr Grumpy's comments about each trip idea are hilarious. I want to go on some of these trips now.